The Battlemage (2018. 457 Pages) is the last in a trilogy, written by Taran Matharu. I have to admit to not reading the first two novels, a situation which apparently has not occurred to the author. The book throws you straight into the group’s plight, trying to escape the ether and the orcs which are chasing them. The problem is that there is little in the way of orientation for a new reader who may have come across the book as a standalone novel. The map at the front is useless for the first half of the book as it does not show the ether, plus it takes about fifty pages before the author mentions that not all of the characters are human. Now, maybe, if you have invested time in the first two books in the series this is not an issue, but to be thrown into the middle of a tale with little in the way of orientation makes it very difficult for the reader to care about either the characters or their situation. I am not sure I was any clearer after the first third of the book what exactly was happening and more importantly why. When they do make it home they find a kingdom on the brink of civil war, once again the book leaves out points of reference needed for a single novel. 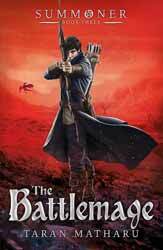 Obviously the book is called The Battlemage so we would expect battles, so, what is odd about the book is its lack of urgency or development. Usually in a trilogy the first book is used to set up a situation, the second for development of characters and positioning your players for the third book where plot points are wrapped up and in this type of book your central hero comes into his full power vanquishing the bad guys. This does not appear to be the case in this series and the third novel spends far too much time on things which would have been better included in the second novel. For this reason the pace of the book is quite slow. I’m guessing that is also why there seems little in the way of character development, the central characters end the book pretty much the same as when they began. Because of the tender ages of the Fletcher and his friends, and because they attend a school of magic, inevitable comparisons will be made with Harry Potter. Potter, however, had a much more mature plot progression. Likewise, the use of demon familiars within the novel has more in common with Pokémon. Overall, the book is well written and I suspect that the target audience is early teen. There is a nice fifteen page Demonology, which has illustrations of various familiars/demons with their Mana abilities and attack/defence stats reinforcing the Pokémon/computer game vibe. But in the end the book is let down, for once, from a lack of exposition.